Though largely ignored by Western audiences Bollywood movies are big business in one of the largest territories in the world. Once mocked for their low budgets (visit Youtube and search for the Bollywood version of Spielberg’s Jaws for a cheap laugh) these days Hindi movies are as stylish as their Hollywoodcounterparts. Many of these films are musicals and influenced by the work of classic directors like Stanley Donen (Singin’ in the Rain). The tone is one of pure entertainment, escapism from everyday life. For an idea of how gloriously demented and funny they can be seek out Om Shanti Om (2007, Farah Khan). 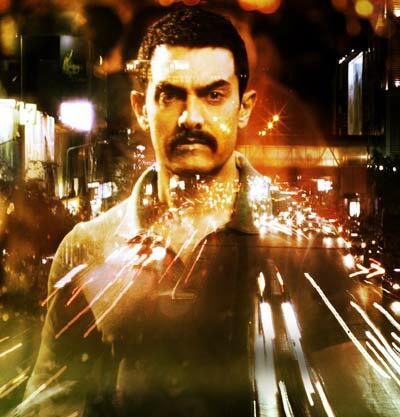 Talaash is something else entirely, a sleek crime thriller with a phantasmagorical edge. The opening credits set the tone with a jazz torch song playing over images of neon-lit strip joints, working girls plying their trade, and beggars in the street. An unusually bleak opening for a Bollywood movie and one which tells us director Reema Kagti is taking a more realistic approach to the material and will not shy away from showing the rougher side of life in one of Mumbai’s roughest areas. Crime thrillers are as much about the man investigating wrongdoing as they are about criminal activity. Inspector Surjan Singh is a grieving father with a crumbling marriage who becomes obsessed with a seemingly unsolvable case involving a dead movie star. Singh develops a bond with Rosie, a prostitute who guides him through the backstreets of Mumbai as he searches for the answers he seeks. Rosy however seems to know more than she is letting on and what began as a simple car accident becomes something much stranger.